Every year, senior lawyers and paralegals representing more than 30 companies in Norway’s energy sector, come together for a 3-day international summit to share ideas and discuss key issues. In 2011 it was Statoil’s turn to host the event. Working with Enigma as our client, our brief was to place the event in Bath, ideally in a single venue with a fixed date. Bath is a beautiful city but it’s not known for its large conference hotels and resorts. In fact there is just one and that was already booked. The dates also coincided with Jane Austin week so the city was going to be bustling with tourists. We had a challenge on our hands but were excited to come up with something special. An international summit in Bath wouldn’t be the same without utilising at least one of the historic buildings there. As it was, we managed to gain exclusive use of four of the most prominent venues in town! 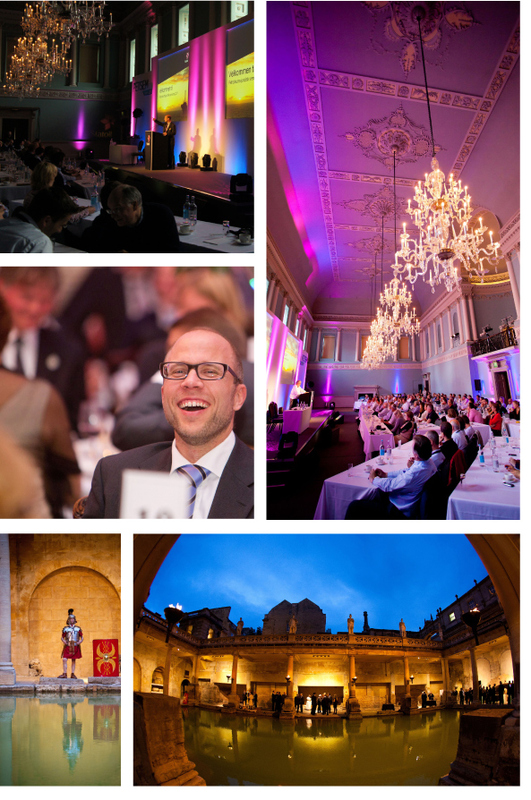 The beautifully majestic Assembly Rooms with their million pound chandeliers would provide the perfect setting for the plenary sessions whilst the world-famous Roman Baths and Pump Rooms would provide the backdrop for a truly unforgettable gala dinner. With the venues covered, we turned our sites to accommodation and secured an exclusive deal with the Royal Crescent Hotel for the duration of the event. With a large, secret garden behind this famous façade and beautiful rooms everywhere you look, this also provided the perfect setting for the reception event on the first night. Taking over two other hotels exclusively and the majority of rooms in a fourth, we now had the ingredients for a highly successful event. Organising everything from airport transfers, sight-seeing tours, specially designed maps, accommodation lists, a social programme and private dinners, we had plenty to do but the planning was meticulous and the end result spoke for itself. We are incredibly proud to be associated with such a unique event and hope we’ll return to Bath in the near future with other events. Statoil is a client of Enigma Creative Solutions Ltd. Intuitive’s team supported Enigma in the event design, production and event management of this project.